(Click on PHOTO to enlarge and hit the back arrow to return to original size). Well we have finally returned from our mini vacation and “Early Thanksgiving” visiting my son. Great visit, always so wonderful to get together. 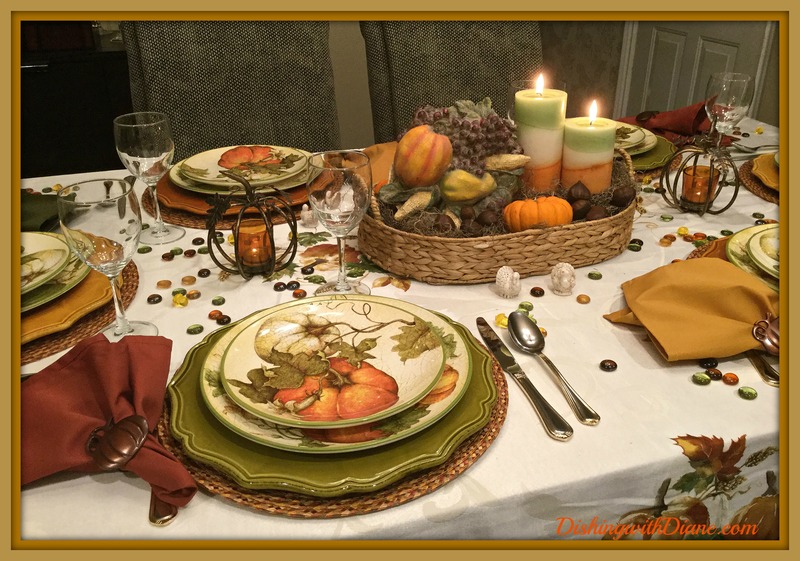 Since I already had my Thanksgiving at my son’s house this year; I will not be preparing a Thanksgiving tablescape for the blog but I wanted to repost last year’s Thanksgiving tablescape for all of our new members. 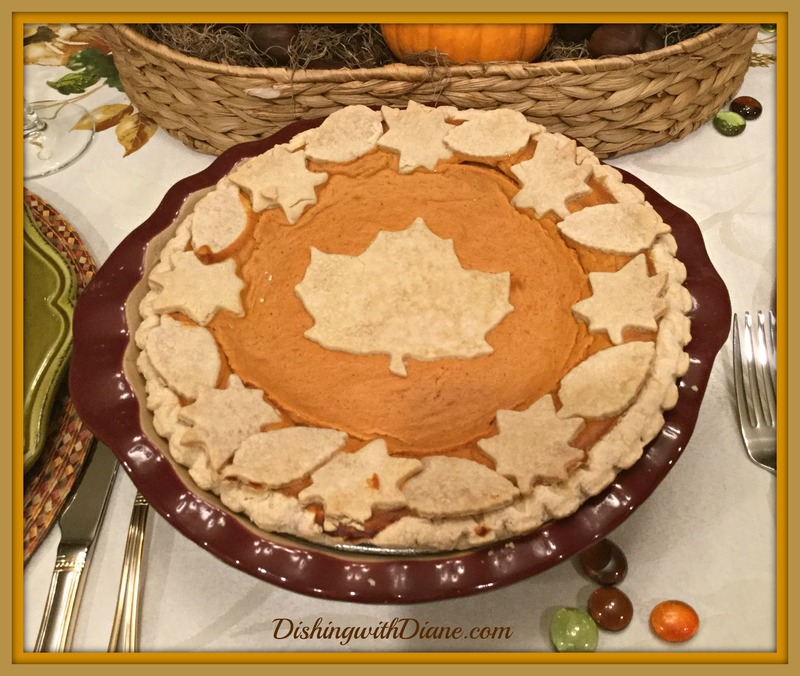 I am very thankful for my friends, family and all my members on DishingwithDiane.com. 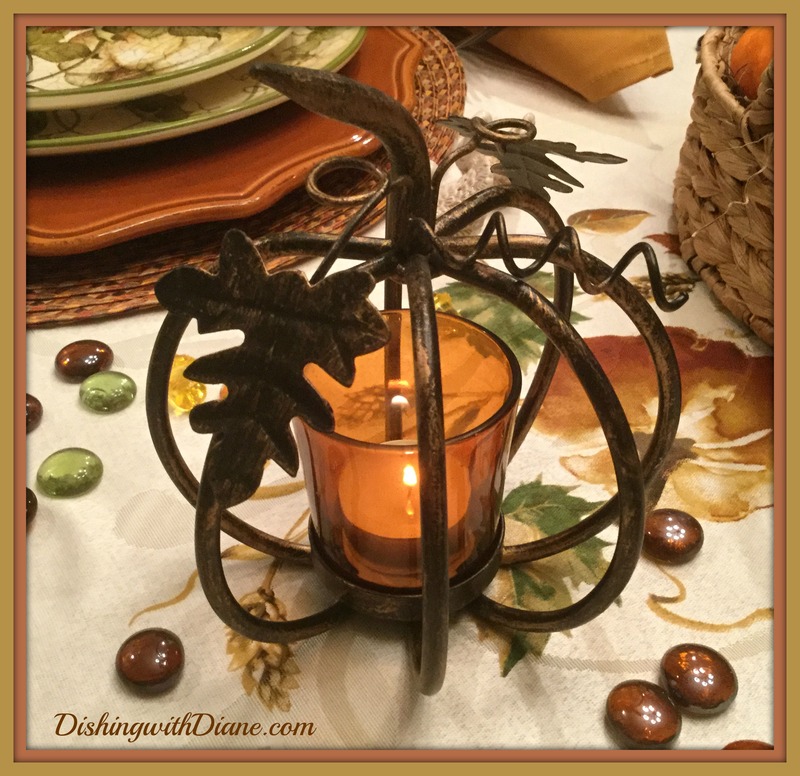 I am thankful that I can share with all of you my passion for decorating, cooking and tablescapes and have the opportunity to meet so many wonderful readers. Have a wonderful, happy, healthy Thanksgiving with all of your loved ones and wishing you many blessings. 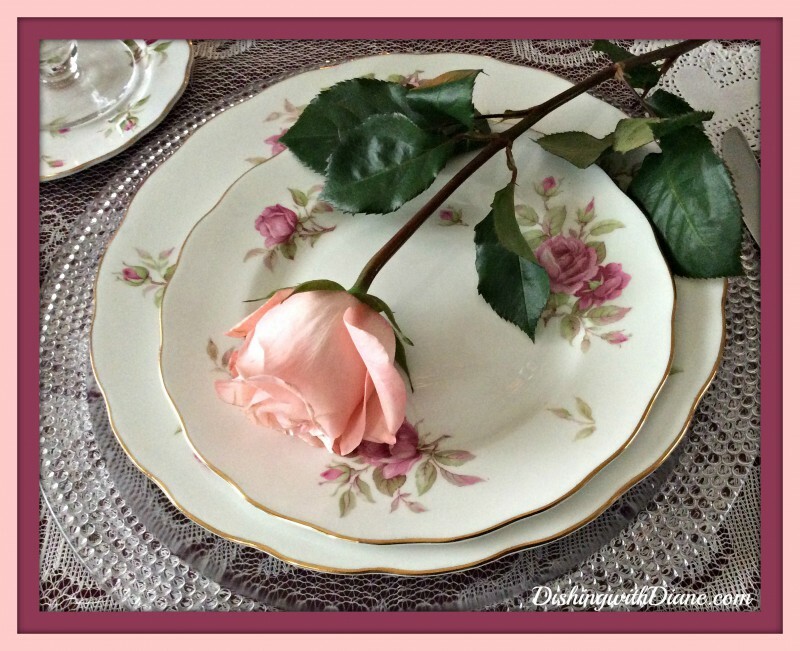 I will be returning soon with new recipes, decorating ideas and more tablescapes. 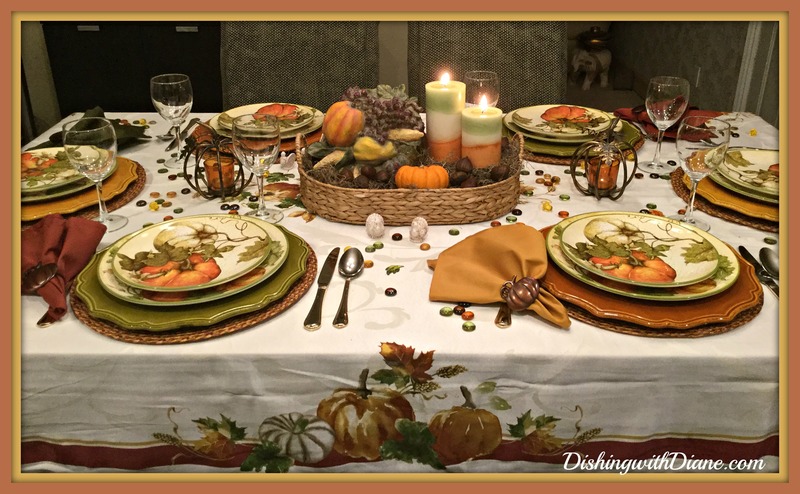 I was so busy shopping & cooking for the holiday that I didn’t have time to post my Thanksgiving tablescape, so here it is. I thought it was so sweet that so many of you sent me emails to see if I was okay because the post wasn’t up on Thanksgiving. I am fine, thank you. I hope you all had a very lovely Thanksgiving with your family and friends. This year for us it was only dinner for two; our son could not be with us this year. Although, if you saw what I cooked, it looked like dinner for 20. I love, love, love Thanksgiving. It has been my favorite holiday since I was a child. Even though we were only two, I prepared all the traditional foods for this holiday. I just couldn’t eliminate anything. (I’ll post some food pictures at the end of the post). Every year after cooking for two days, I say that I am going to cut down on what I prepare for the next year and then while food shopping, my Italian gene kicks in and I go overboard. Every dish I prepare is a memory and a link to when my family was still here with me. How I wish those days could come back. The only thing I did change this year was the size of the turkey because it was only Bob and I. 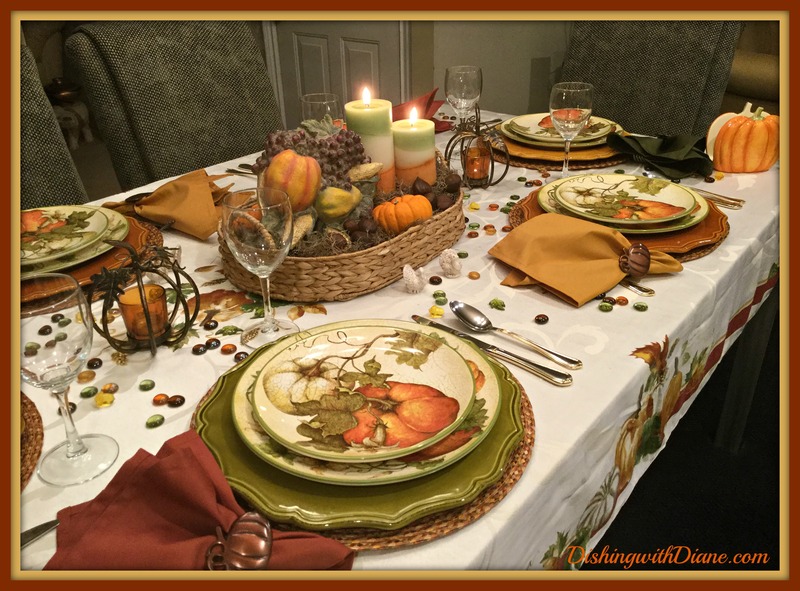 This year my Thanksgiving tablescape was completely different from years past. 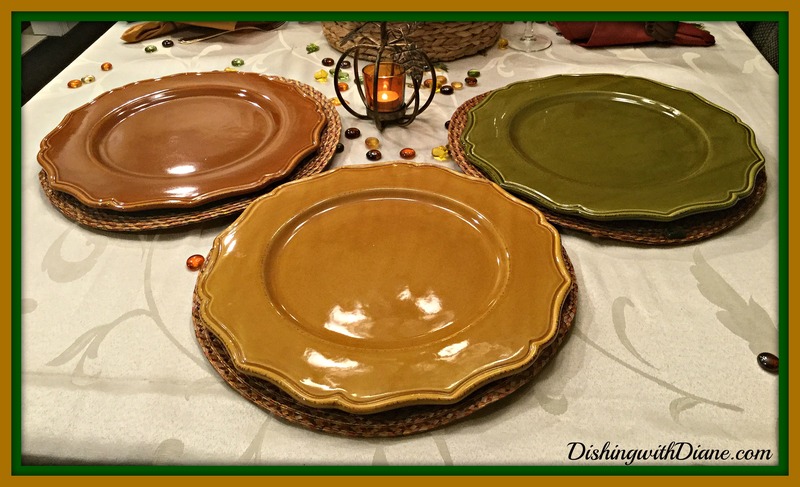 I usually have solid dinnerware in fall colors with matching chargers along with turkey accent plates and platters. 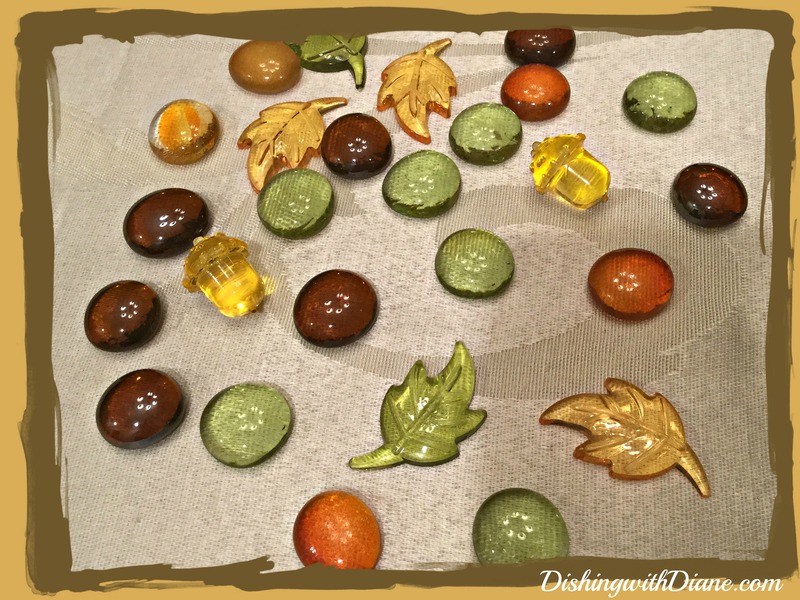 Some autumn colored votive candles and autumn leaves scattered around the table on a leaf design tablecloth. Not this year…. This year something new caught my eye. 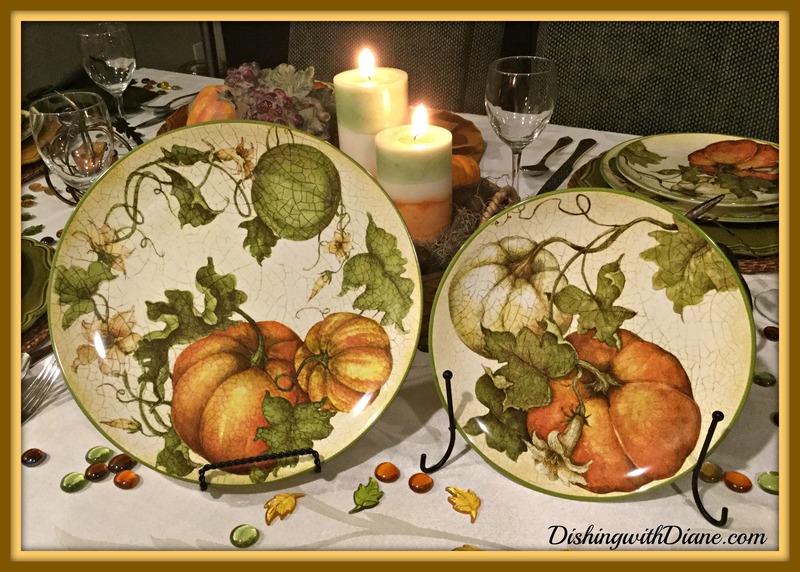 Every Fall catalog that I received from either Pier 1, William Sonoma, Crate and Barrel and Pottery Barn had pumpkin designed dinnerware; but one pattern really caught my eye and that was from Pier 1 (Pier 1 has become my 2nd home these days). What attracted me the most to the dishes was the glazed crackled finish giving it some Old World charm. 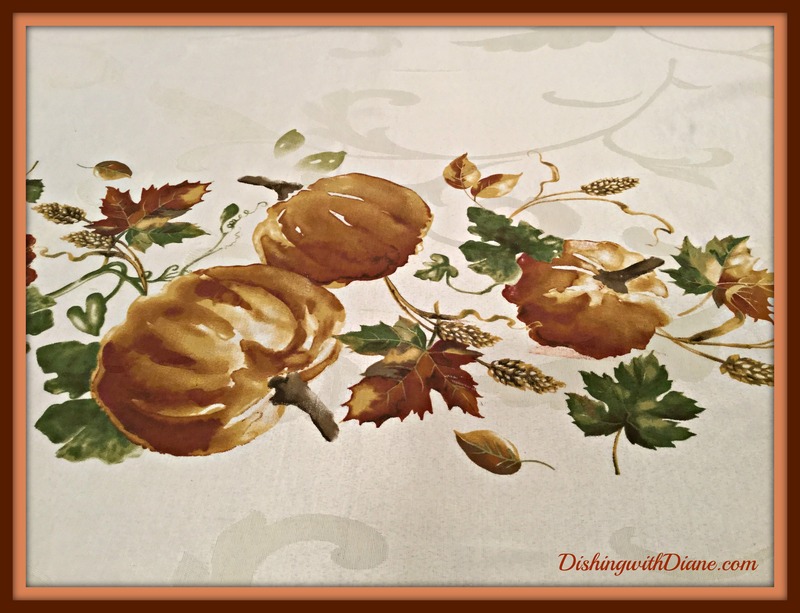 The dish is an off white crackled background with pumpkins and vines in soft colors of orange, beige and olive green. 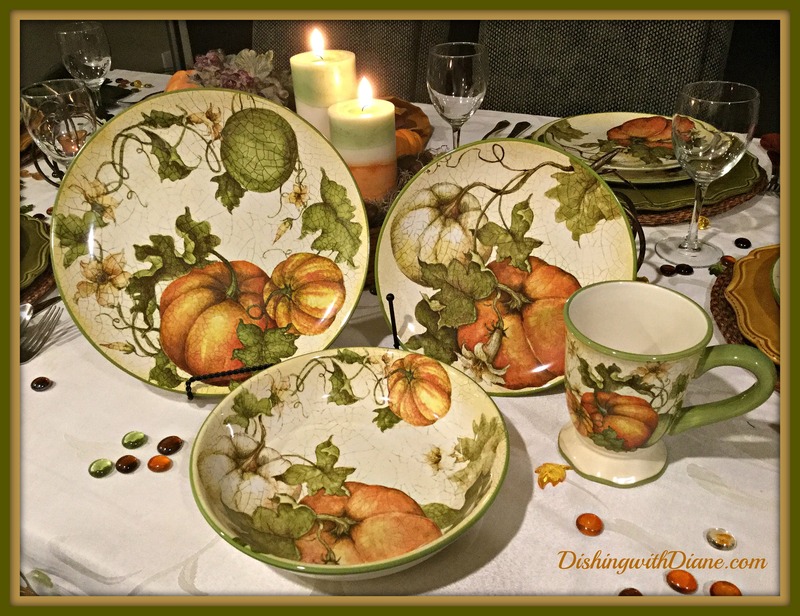 I bought a pumpkin tablecloth last year that I never used that I thought would look great with these dishes since it had a similar pumpkin and vine design. 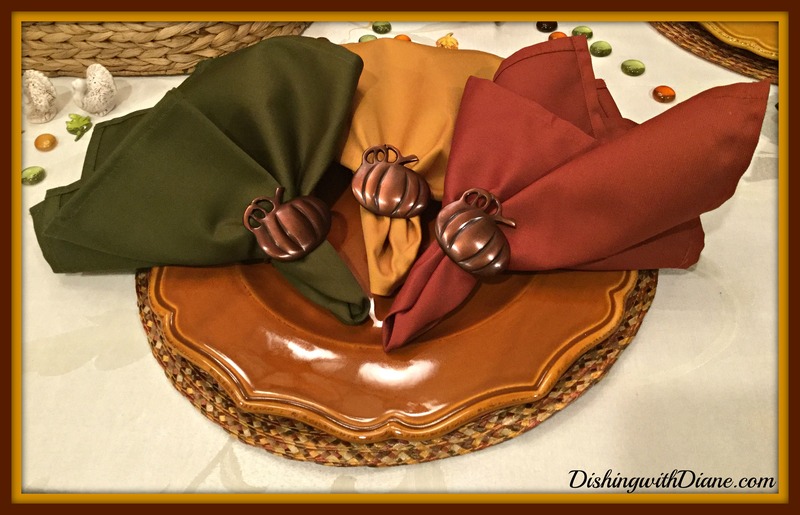 I am using my annual Thanksgiving napkins in assorted autumn colors and a bronze pumpkin napkin ring. 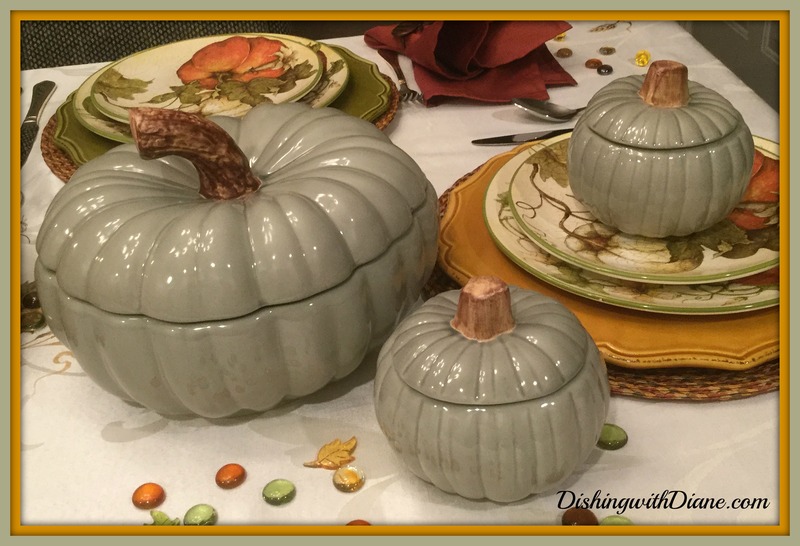 Since you all know by now that that primo course of our Thanksgiving menu is “Uncle Vinny soup”; I am keeping with the pumpkin theme and using a glazed ceramic pumpkin soup tureen with matching pumpkin soup bowls. The soup tureen and bowls are sage green in a glazed finish. 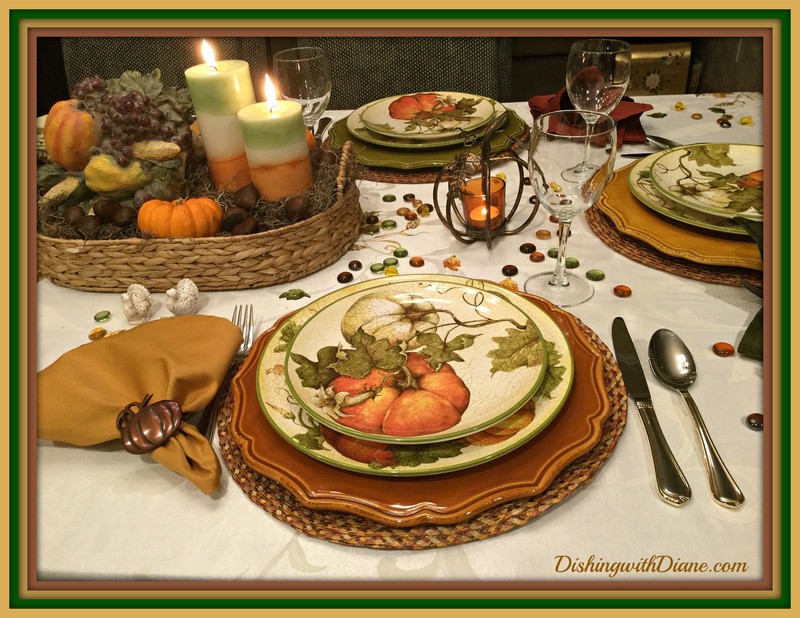 (I didn’t display the soup bowls in my pictures so you could get a good look at the pumpkin dishes; but we used them during dinner). 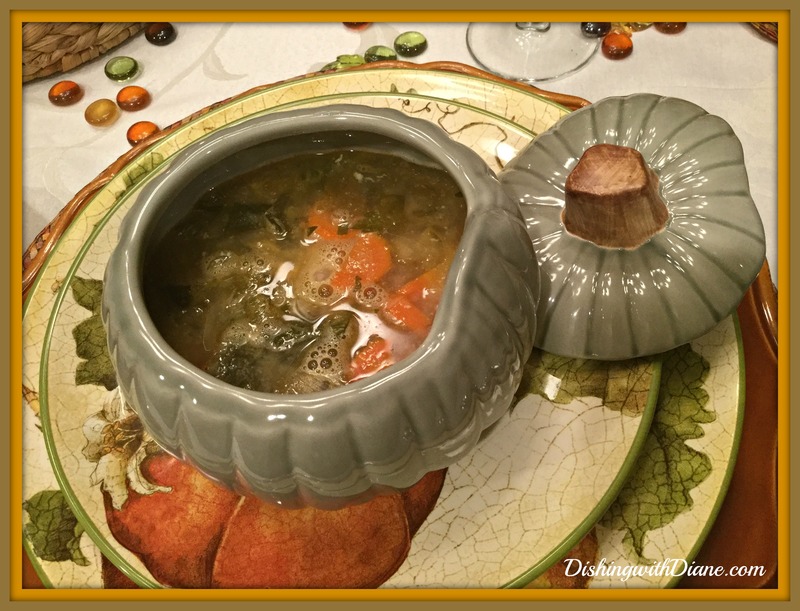 This is my go to soup tureen for this holiday. I should just rename this the “Uncle Vinny soup tureen & bowl set”, since I only use it once a year for this soup. The chargers I chose are the same ceramic chargers in solid autumn colors that I use every year. They are just perfect for the holiday. I have had these chargers for many years and they are in assorted colors of olive green, gold and bronze. 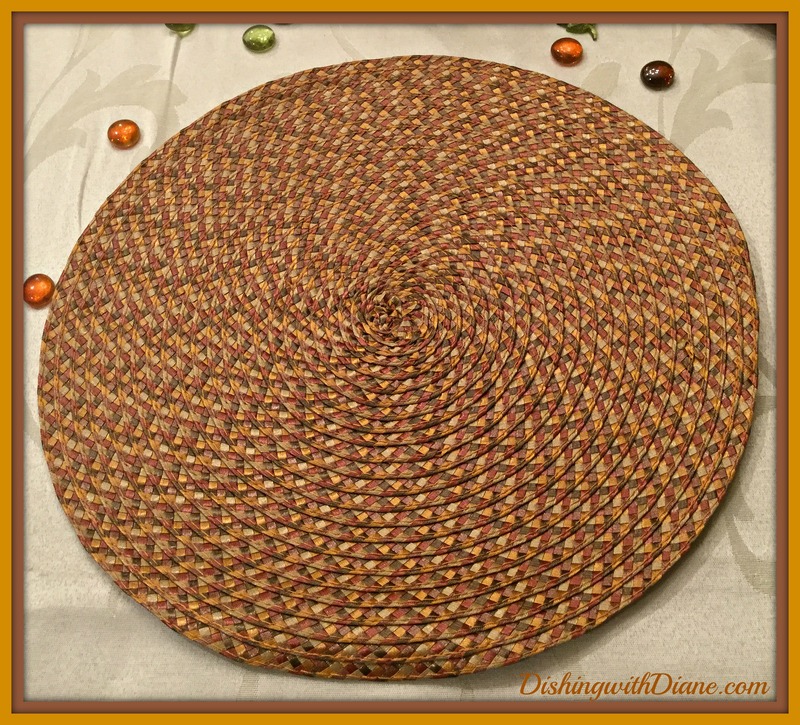 At first I was undecided if I wanted to use a placemat and then after going through my collection, I decided to use a woven placemat with autumn colors of gold, bronze, rust and brown . 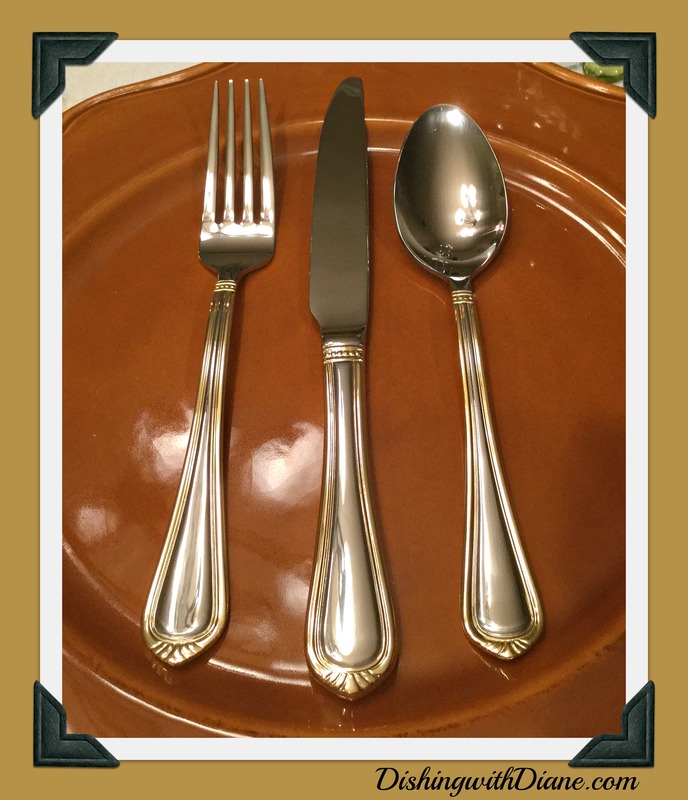 I am using my everyday flatware in a gold and silver. 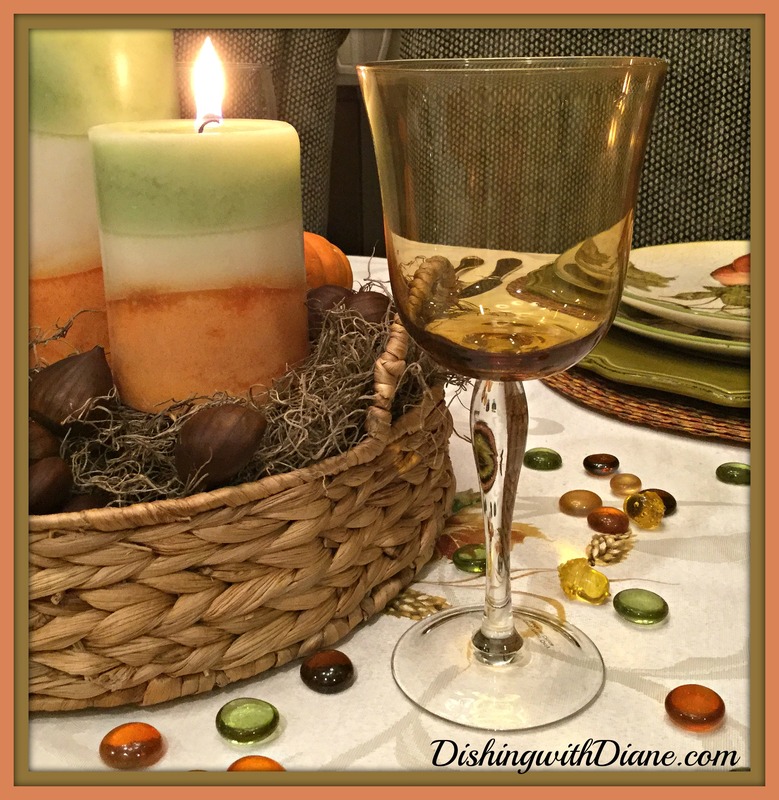 The glassware I selected were gold goblets; another Thanksgiving favorite. Unfortunately, while taking them out of the box, we discovered that two were broken. Since I didn’t have enough remaining to set the table, I quickly switched to a plain clear goblet. Just to show you the gold goblet, I took a picture and Bob and I used them for a cocktail. (About that later). Now for the centerpiece. 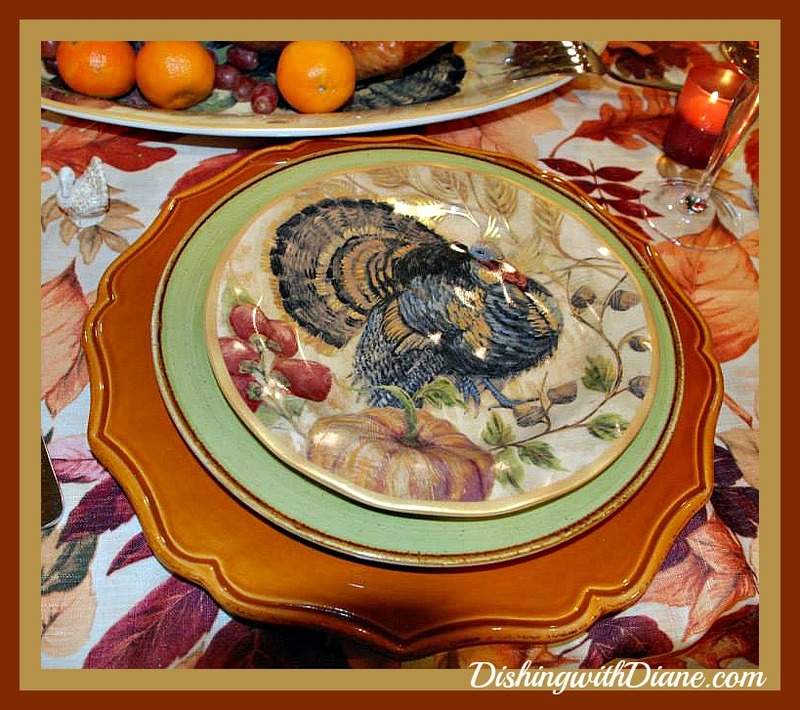 Every year I use my ceramic cornucopia as part of my centerpiece. 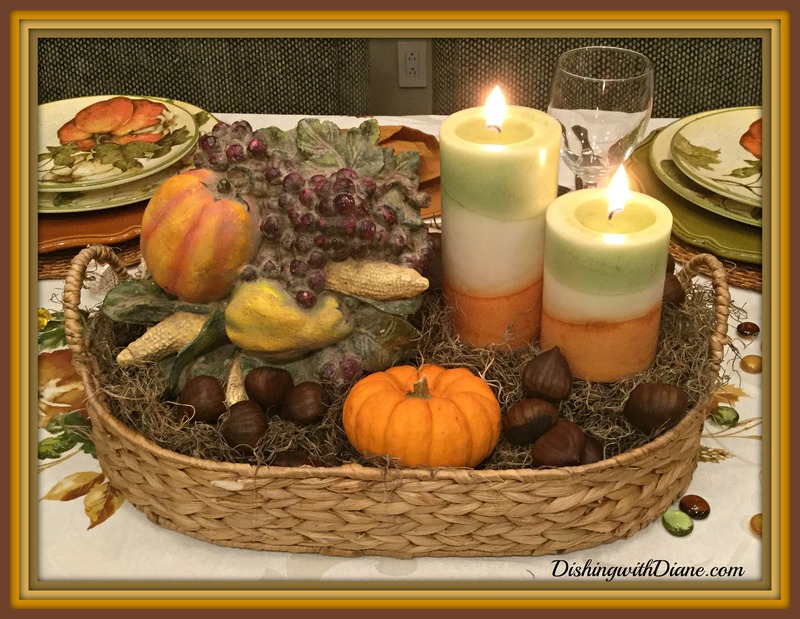 This year I decided to put the cornucopia in a natural basket along with pumpkins, chestnuts and the most beautiful candles. I had to buy these candles as soon as I saw them because the colors match the colors in the dish perfectly. 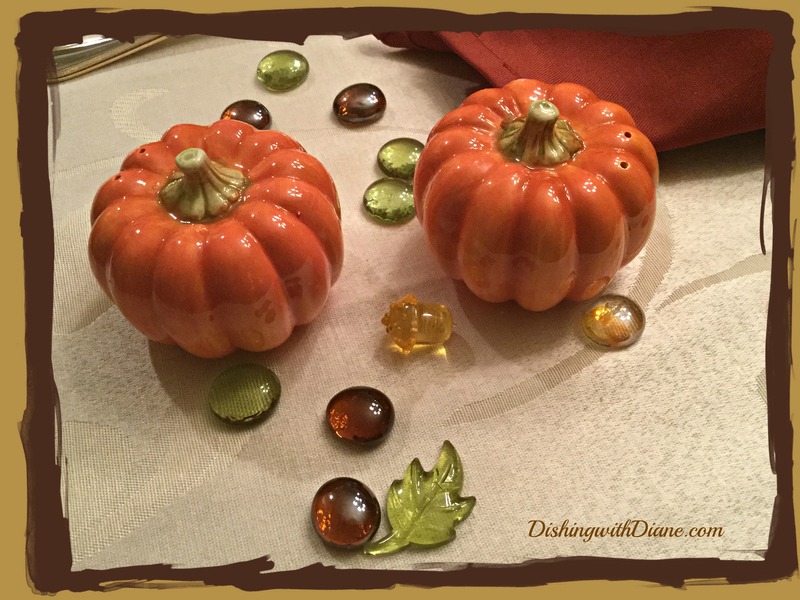 I placed pumpkin votive candle holders on each side of the centerpiece with a pumpkin spice scented candle. The house smells wonderful. You know I love candles. 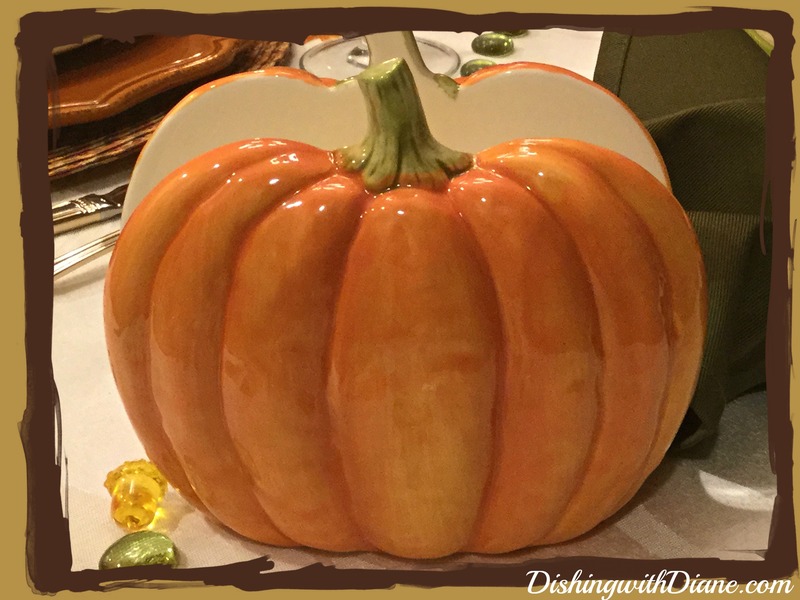 and a ceramic pumpkin napkin holder. and mini ceramic turkey salt & pepper shakers. 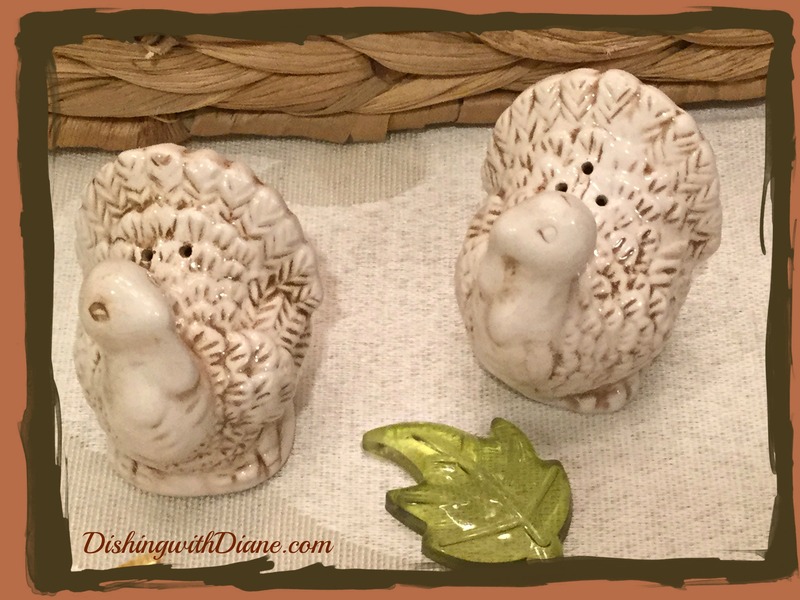 Many times I use salt and pepper shakers for accent pieces on the table to carry the theme and not for salt and pepper. 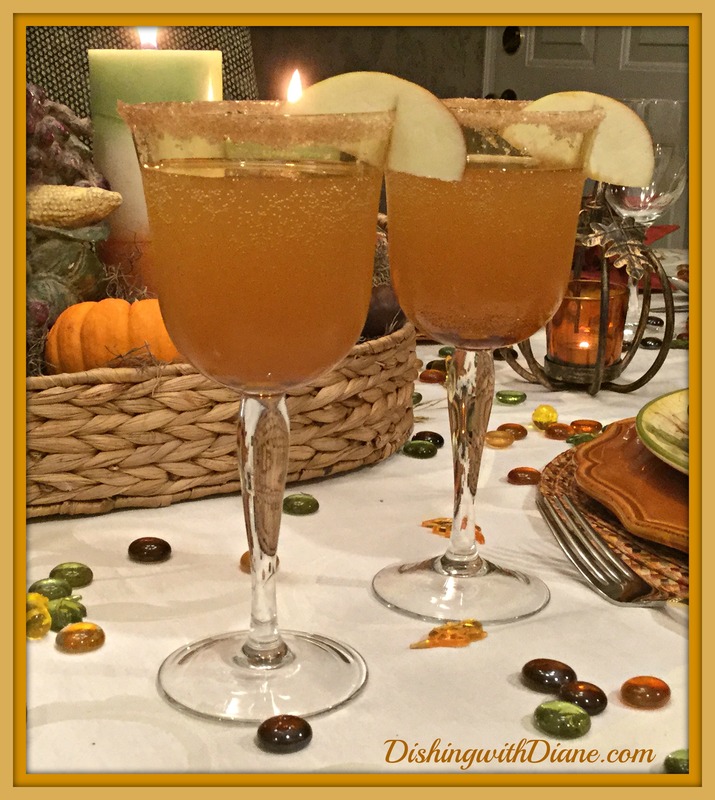 Bob and I toasted the holiday with an Apple Cider Bellini– just delicious! The recipe is very simple. Rim your glass with cinnamon sugar, fill the glass half way with apple cider & top it off with Prosecco. Garnish with a thin slice of apple. 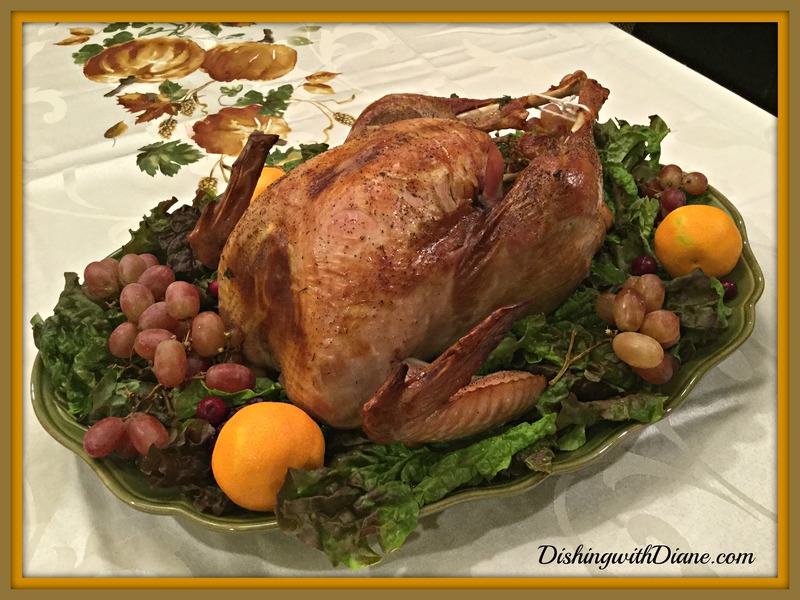 Here are pictures of my Thanksgiving 2015 turkey, dinner plate & dessert plate. Of course we started off with Uncle Vinny soup. 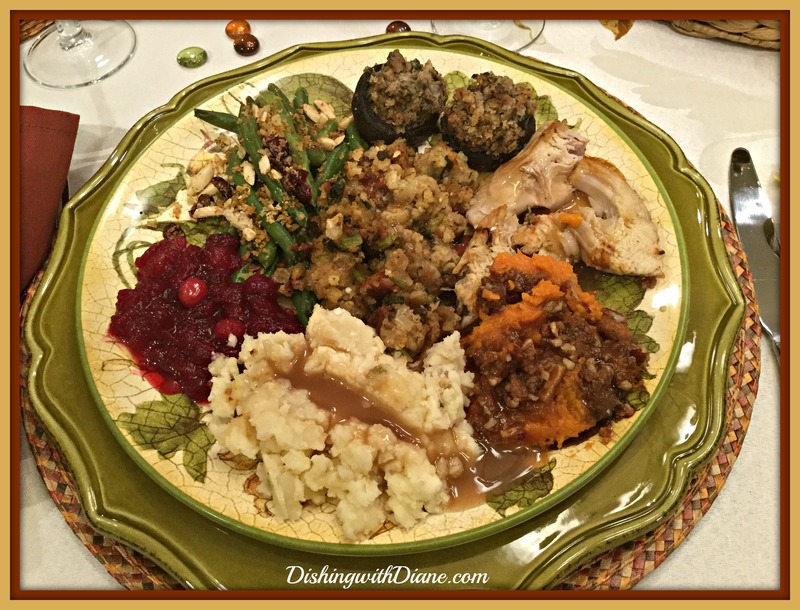 Along with the turkey, we had sage stuffing, sweet potato casserole, stuffed mushrooms, mashed potatoes, homemade cranberry sauce, green beans with almonds, cranberries and toasted breadcrumbs and homemade gravy. 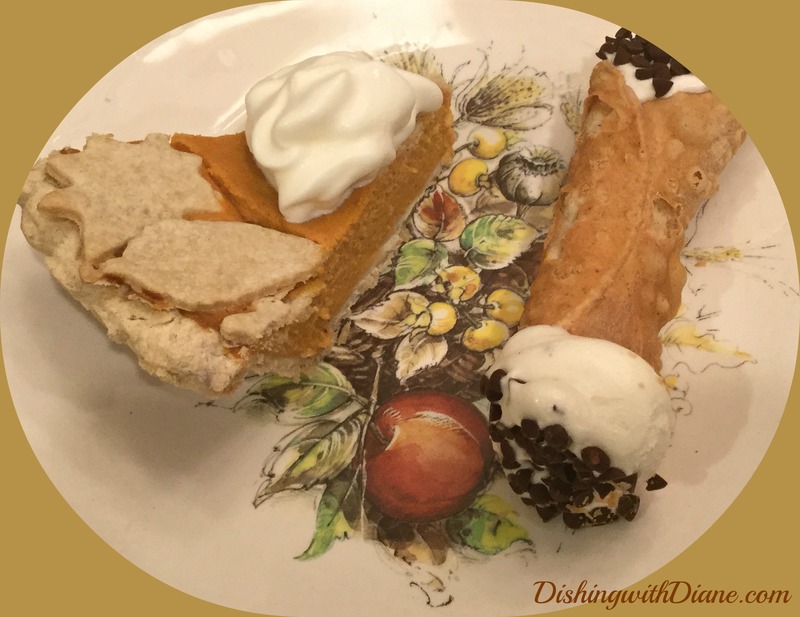 And lets not forget dessert…..
Sweet potato pie infused with rum topped with whipped cream. This was my first attempt at this pie and Bob loved it. with an ice cream cannoli on the side. My annual “guest” to the table is a stuffed animal my Dad gave me and I display it every year. 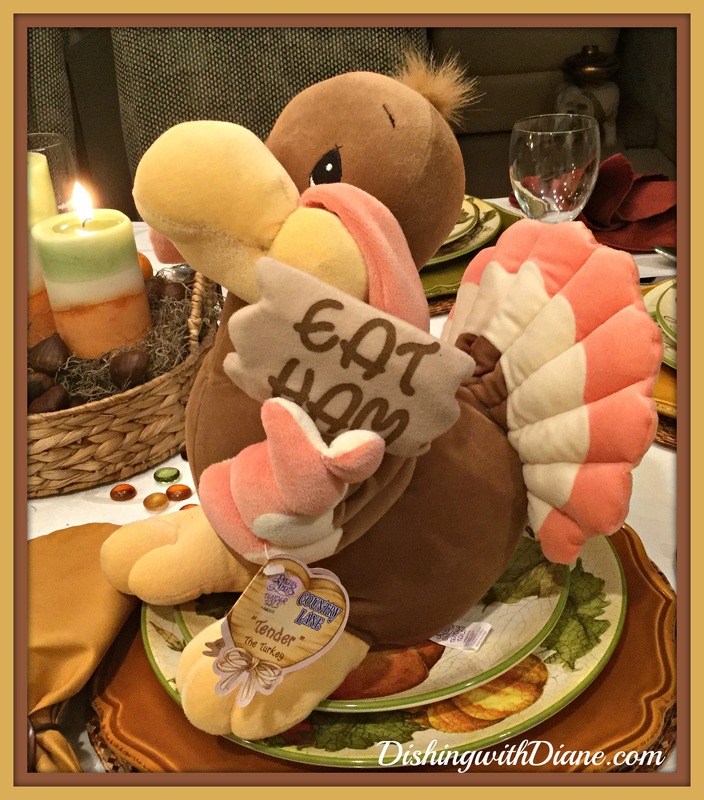 It’s a turkey holding an “Eat Ham” sign. Shopping in Hallmark with my Dad one day, I thought it was so cute. Next thing I knew, Dad bought it for me and brought it as his guest for Thanksgiving. It was a great meal and now I look forward to making turkey soup and turkey pot pie. My wish for you are many blessings and I hope your blessings last a lifetime! Be grateful for the precious gift of family, good friends, good food, a home and good health. My sincere best wishes always. This entry was posted in Uncategorized on November 22, 2016 by aries041158. Happy Thanksgiving Diane and Bob! I love your tablescapes as always! I am going to try a tablescape for Christmas. I host every year for Dan’s family! I will try to send you pictures. 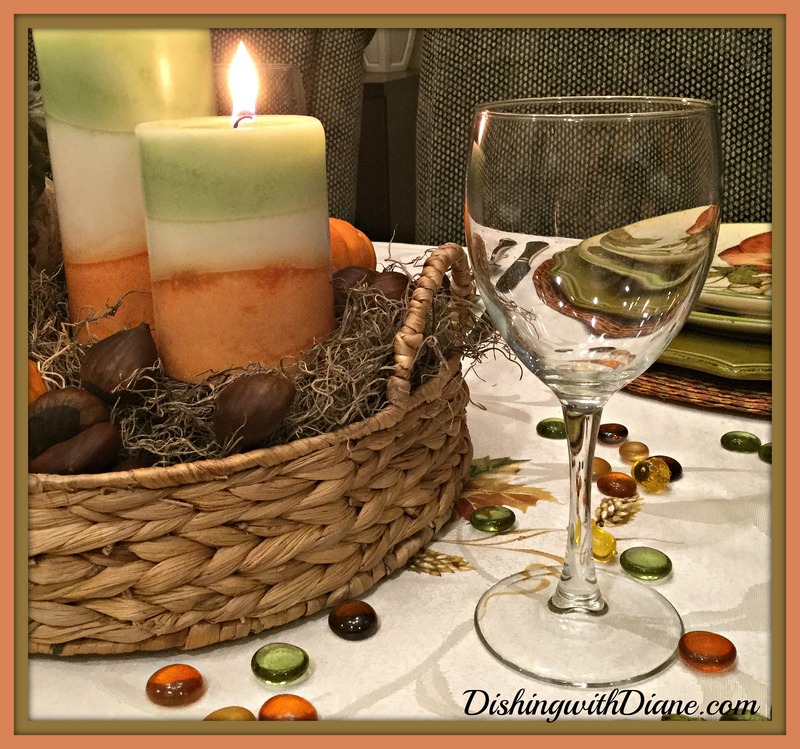 Everything about your tablescape for the Thanksgiving dinner is beautiful. Love the colors and design. Pier 1 imports is my second home too. The food looks delicious. Glad you had an early Thanksgiving with your son and Bob. Happy and Healthy Thanksgiving to you and your family.